The waiter was so scared and ran and hid! Mmmm First Day First Art Blog, where to begin….Perhaps with my Passions and I have lots, lol, but my two first loves are my Family and Art, and another would have to be travelling. 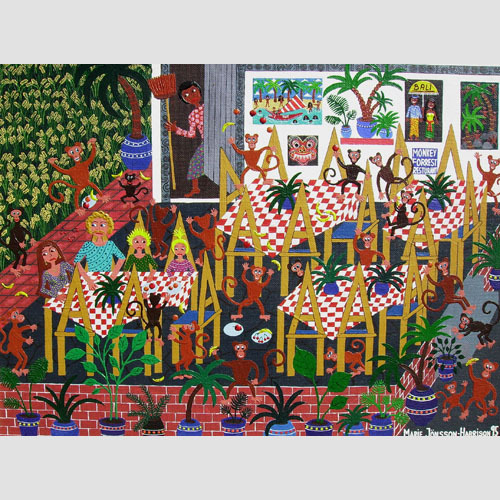 That said, here is my painting of the Monkey Forest in Ubud, BALI, painted perhaps 13 ish years ago, when the kids were little. Our holidays have always been fantastic and this was no exception. We decided to have lunch in this pretty little cafe surrounded by the luscious nature and cute little monkeys, and on one side a rice field. Our waiter gave us our menus and pulled out the chairs for us to sit down. It was lunch time but we were the only customers there. Mmm maybe that should have been a clue…. We had just motioned for the waiter to take our order, when a very large male monkey with big teeth came slowly walking into the cafe from the rice field and our waiter very quickly, ran and shut the door behind him to the kitchen. I told the kids under my breath to “SIT VERY STILL, DONT MOVE A MUSCLE AND DON’T MAKE EYE CONTACT”. So there the 4 of us sat like statues, whilst this teeth baring large male monkey walked very slowly around our table looking very intently at us, sniffing the air, stopping every now and then. After what seemed like the longest time he finally decided that as we did not have any food or anything else he fancied, he walked around the corner. Not sure of whether he would come back we sat still for a little longer but now at least we were breathing again. It took a full 2 more minutes before our waiter with a big broom opened the door and peaked out and asked if the monkey had gone yet- so much for customer relation.lol. Needless to say we had lost our appetite and found another place for lunch later on. Lol. Lucky for me that supplied me with a perfect topic for another painting. I must confess to artistic licence though as the other monkeys were not all inside the cafe. You will find my son Kai, daughter Hillivi and husband Bryan, in a lot of my artwork. Even thought they are now 22 and 18 I often still paint them as little. They will always be my little “Sweethearts”. Hope you come and visit me again. Happy painting and sculpting to everyone!